The cell. 4. Nucleus. Nuclear pore complex. Atlas of plant and animal histology. The nuclear envelope consists of and outer membrane, an inner membrane, and a perinuclear space between them. At some points, the inner and the outer membranes are fused in a way that form open channels that make possible a direct communication between cytoplasm and nucleoplasm. Nuclear pore complexes are located in these channels of the nuclear envelope. They are very large protein aggregates, so big that can be observed with the electron microscope (Figure 1). They are the communication gates between nucleoplasm and cytoplasm since all the molecular trafficking between these two compartments occurs through the nuclear pore complexes. Controlling this traffic is vital for the cell. For example, the entering of transcription factors into the nucleus influences the expression of particular genes, and the exit of mRNA makes possible the synthesis of proteins. 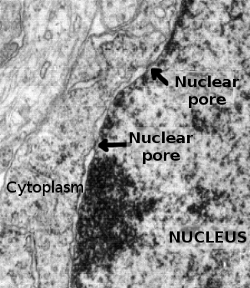 Thus, nuclear pores are a key element during cell physiology. Figure 1. Transmission electron microscopy image of the nuclear envelope. The two constrictions of the nuclear envelope are nuclear pore complexes. Nuclear pore complexes are very abundant in cells showing an intense trafficking between nucleoplasm and cytoplasm, as in differentiating cells. It is estimated around 11 nuclear pore complexes by μm2 of nuclear envelope, which means around 3000 to 4000 nuclear pores in one cell. In the cell cycle, new nuclear pore complexes are synthesized and assembled during interphase, previously to mitosis. However, they are also synthesized after cell division. In open mitosis, where the nuclear envelope gets disorganized, the nuclear pore complexes are also disorganized and the its proteins are free in the cytoplasm. After mitosis, these nuclear pore proteins are grouped again in new nuclear pore complexes while the nuclear envelope is assembled at the same time. Proteins of the nuclear pore complexes are known as nucleoporins. In yeasts, 30 different nucleoporins have been found, whereas in metazoa may be more than 40 different nucleoporins. There are several copies of each nucleoporin in the same nuclear pore complex. Thus, in mammals, a nuclear pore complex contains around 500 to 1000 nucleoporins. The total structure is 100 to 150 nm wide, 50 to 70 nm high, and contains an inner hydrophilic passage of around 40 nm. Nuclear pore complexes are among the largest protein structures of the cell, about 125000 kDa. It is remarkable that nucleoporins show a great stability, sometimes as long as the whole life of the cell, whereas the lifetime of a common protein may last a few days. Nucleoporins are grouped in 8 blocks, which are organized as a regular octagon forming ring-like structures (Figure 2). 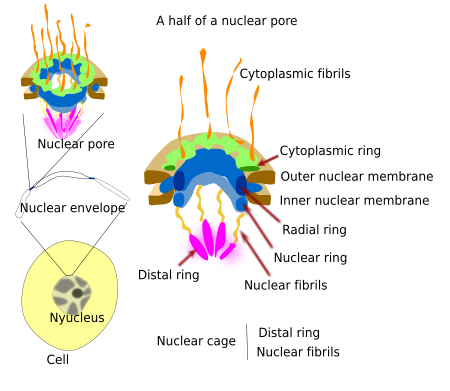 The cytoplasmic ring faces the cytoplasm, the radial ring is in the channel of the nuclear envelope and anchors the nuclear pore complex to the nuclear envelope, and the nuclear ring is facing the nucleoplasm. Furthermore, there are fibrils extending from each of the 8 blocks: cytoplasmic fibrils and intranuclear fibrils. The intranuclear fibrils are connected to the nuclear ring by one of their ends and to other proteins that form another intranuclear ring known as distal ring. Intranuclear fibrils and distal ring form the nuclear basket, also known as nuclear cage. Besides the structural role, nucleoporins are classified according to their function. There are transmembrane proteins for anchoring the whole complex to the membrane of the nuclear envelope. The scaffold proteins form the rings, and inner proteins that form the hydrophilic passage and regulate the molecular trafficking through the nuclear pore complex. Those proteins that form the fibrils and nuclear cage recognizespan> the molecules, and are therefore allowed to cross the nuclear passage. I should be noticed that molecules coming in and going out of the nucleus do no need to cross any membrane, but just the hydrophilic channel. Nuclear pore complex contains an hydrophilic passage of about 80 to 90 nm in diameter. When nuclear pore complex is at rest (no trafficking) the usable space is about 45 to 50 nm in diameter, and it can be increased when some molecule is being transported. Small molecules (less than 60 kDa) like salts, nucleotides, small molecules and short polypeptides can cross freely through the hydrophilic channel, but other larger molecules with physiological roles are not allowed to across freely. Even some molecules smaller than 20-30 kDa such as histones, tRNAs and small mRNAs may need the involvement of the nucleoporins to cross the nuclear envelope. The selective transport, mediated by nucleoporins, is known as passive facilitated transport. Energy is not needed for it. The nuclear pore complex does not determine the direction of the transport, getting in or out the nucleus, but molecules travels according to a gradient of the Ran proteins (Figure 3). The energy is spent in generating this Ran gradient. Figure 3. Ran gradient between the cytoplasm and nucleoplasm. In the cytoplasm, the energy needed to create this gradient is supplied by ATP, transforming Ran-GDP in Ran-GTP. Thus, the nucleoplasm is a sink of Ran-GDP and a source of Ran-GTP. 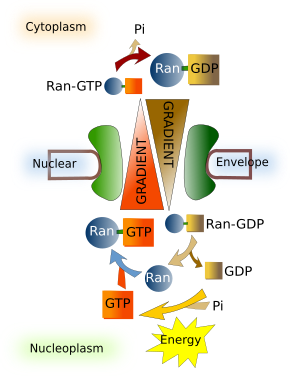 In the cytoplasm, Ran-GTP is converted in Ran-GDP. Thus, the cytoplasm is a source of Ran-GDP and a sink of Ran-GTP. In this way two gradients are created, Ran-GDP and Ran-GTP. The size of the icons in the figure depicts levels of concentration. Trafficking through a nuclear pore complex is high, with more than 1000 translocations per second. This movement of molecules across the nuclear envelope is regulated by the gradient of Ran proteins. Ran are involved in both importing and exporting molecules between the nucleus and the cytoplasm. They generate the Ran-GTP/Ran-GDP needed for the transport, and it is the generation to these gradients that consumes ATP. Ran molecules can be in three states: Ran-GTP, Ran-GDP and Ran. The state of a Ran molecule depends on several enzymes. In the nucleoplasm, Ran-GDP is more abundant, whereas Ran-GTP is concentrated in the cytoplasm (Figure 3). Caryopherins are a family of proteins, divided in two subfamilies: importins and exportins, responsible for selecting the molecules that can cross the nuclear pore complex. Proteins that need to be imported into the nucleus have a particular amino acid sequence, known as entrance signal peptide, and those that need to be exported to the cytoplasm have an exit signal peptide. These short peptide sequences are not identical for all proteins, but similar. The entrance and exit signal peptides are recognized by importins and exportins, respectively. There are members of importins and exportins with different affinity for the import and exit sequences. Nucleoporins do not interact directly with the transported molecules, but with importins and exportins. Importin and exportin use the Ran-GTP/Ran-GDP gradients for transporting the cargoes in a specific direction. In this way, importins spontaneously joins to their cargoes in the cytosol, but once in the nucleoplasm cargoes are released by Ran-GTP, which is abundant inside the nucleus. 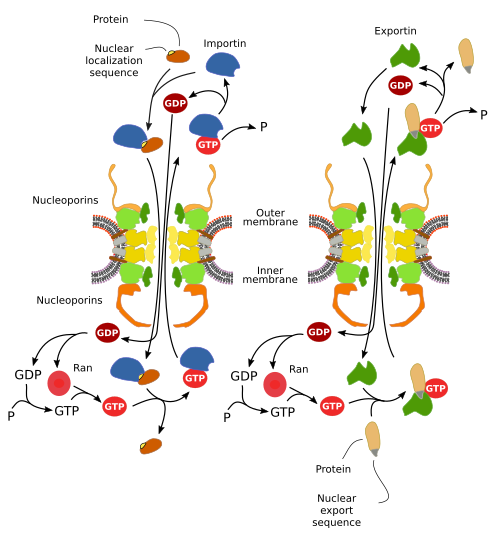 On the other hand, exportins need Ran-GTP to join to their cargoes in the nucleosplasm, but once they (exportin-cargo-Ran-GTP) are translocated to the cytoplasm, Ran-GTP is converted in Ran-GDP that breaks the complex, and exportin, cargo and Ran-GDP are detached from each other and are free in the cytosol (Figure 4). Figure 4. Molecular trafficking across the nuclear pore complex mediated by caryopherins: importins and exportins. Molecules to be specifically transported across the nuclear envelope need to have export or import sequences, but it is no enough. These sequences need to be accessible to exportins and importins. Conformational changes or chemical modifications of the molecules having these sequences may prevent karyopherins recognizing them, so they remain in the nucleoplasm or cytoplasm until the sequence is exposed. This mechanism adds a new layer of regulation to nucleus-cytoplasm trafficking. Besides proteins, other molecules need to cross the nuclear envelope. Different types of RNA are transported by different mechanisms, but there are always proteins involved. mRNA is not transported naked. Once the mRNA transcript is synthesized, it is quickly associated with different nuclear proteins forming a large size molecular complex known as ribonucleoprotein. Before mRNA is transported, a quality control checks if it has been correctly processed. If there are errors, the mRNA is degraded and it does not reach the cytoplasm. If there are no flaws, the ribonucleoprotein is transferred to the nuclear basket of the nuclear pore complex and gets associated with the proteins Nxf1-Nxt1, which facilitate the transport through the hydrophilic channel. This transport does not use the Ran-GTP gradient. However, it needs the hydrolysis of ATP, which is consumed when the macromolecular association (ribonucleoprotein-Nxf1-Nxt1) needs to be disengaged in the cytosolic face of the nuclear pore complex. Then, ribonucleoprotein is freed from Nxf1-Nxt1 and can not get back to the nucleus. Some mRNA molecules uses the protein CRM1 to be transported. In this case, the Ran-GTP gradient is needed. Transfer RNA (tRNA) is recognized by a type of exportin known as exportin-t, which uses the Ran-GTP gradient to get the tRNA out from the nucleus. Small nuclear ARN (snRNA), another type or RNA, is transported by CRM1 protein and Ran-GTP gradient. The exporting mechanism for ribosomal subunits, which are assembled in the nucleolus, is a big challenge for nuclear pore complexes because they are really large protein-rRNA complexes. The molecular changes happening in the nuclear pore complex allowing the ribosomal subunits to get to the cytoplasm is not known so far. Finally, it has been found some proteins that are able to bind directly to nucleoporins, so they do not need karyopherins. Nuclear pore complexes are involved in additional functions that help in the regulation of the nucleus-cytoplasm communication. In this context, they are thought to participate in DNA repairing, and in the regulation of transcription, processing and quality control of mRNA. At transmission electron microscopy, it is observed that heterochromatin is no distributed near the nuclear pore complexes (Figure 1). Thus, they are regarded as spots of permissive gene expression of many genes. This would be an advantageous position for those genes since their transcripted mRNAs are released close to the gateway. The lack of heterochromatin near the nuclear pore complexes may be a consequence of direct interactions between nucleoporins and chromatin. Nucleoporins are evolutively related to COPI and COPII proteins, which form the coated vesicles coming from the Golgi apparatus and rendoplasmic reticulum, respectively. It makes sense because the nuclear envelope and endoplasmic reticulum membranes are continuous, and Golgi apparatus membranes are formed from vesicles coming from the endoplasmic reticulum.